An elderly Mount Maunganui man suffered wounds across his body as he fought for 10 minutes to free his pet bichon from the jaws of a "PSYCHOTIC" BULL TERRIER intent on tearing it apart. 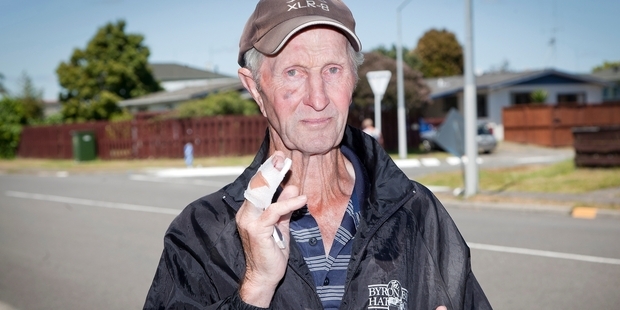 Dave McLennan, 73, suffered dog bites to his hands which severed tendons in his fingers, while the prolonged struggle left him with scratches and grazes to his arms and legs. His eyes filled with tears as he stood in the same spot and recalled the horrific attack that left his 14-year-old bichon with fatal injuries, on Friday. Mr McLennan and his wife Margaret, 80, were finishing their daily walk - heading home along Grenada St about 9am - when a roaming bull terrier set its sights on their bichon, DJ. "It just ran past us and grabbed him," Mr McLennan said, recalling as it launched into a deadly attack. As soon as the bull terrier latched on to DJ, Mr McLennan tried to pull the two apart. The fight took them down the side of a nearby house before Mr McLennan managed to hold the bull terrier long enough for his wife to get away with DJ. "But it was too strong ... The dog got away from me and made a straight beeline for her ... The dog chased after her and jumped up on her and tore DJ from her ... grabbed him by the leg and dragged him down," he said. "I wrestled DJ from his mouth, blood dripping." What followed was minutes of back-and-forward as Mr McLennan tried to save their beloved pet as it was mauled in front of them. "After three or four tries it dragged him under the tree. It wasn't letting him go. "It tore at DJ's neck, ripped tendons so he couldn't move his legs to get away." There was no time for Mr McLennan to consider his own safety. "I couldn't do anything else. The poor little fella was screaming his head off." His wife managed to grab DJ and jumped into a woman's car, who had just pulled over when she saw the ordeal. It was the only way they could stop the attack, Mr McLennan said. As Mrs McLennan and DJ found safety, a woman in a neighbouring property heard the commotion . The woman, who did not want to be named, said Mr McLennan put his life on the line for his pet, against an animal that appeared "psychotic". "When I came out, this man [Mr McLennan] was on the ground holding the dog down, blood everywhere and his wife had just got in the car with their dog." She ran to get rope from her house and tied the bull terrier to a fence until police arrived shortly after. The woman in the car took the couple home to retrieve their own car. "She took us back to the village so we could get our car and get straight to the vet. But it was too late," Mr McLennan said. Police said DJ was put down "as a result of the severe injures it sustained". "My wife is totally distraught," Mr McLennan said, struggling to speak. "He was her pride and joy." Mr McLennan returned to the site of the horrific ordeal three hours later to search for his watch which was ripped from his wrist during the attack. Reunited with the neighbour who tied the dog up, he thanked her repeatedly and the pair hugged. "It takes a lot for people to come and help in that situation because you don't know what the dog will do" he said to her. He walked slowly with bandages around his fingers, knees and elbows, still visibly shaken and tearful. "It was absolutely terrible. It'll take a long time to get over, after 14 years," he said. The bull terrier was seized by animal control who were working with police yesterday to investigate the matter. A police statement said the bull terrier was microchipped. Council animal services team leader Brent Lincoln and his team knew who the owners were and would be speaking to them. "It would've been very scary for the couple," he said. The investigation was continuing and no decision had been made. Sigh, another horrific fatal dog attack because pit bulls are just like regular dogs. What makes more sense, humanely euthanizing pit bulls because they're inherently dangerous, or allowing pit bulls to brutally kill defenseless Bichon Frises? Elderly couples are not capable of defending themselves, let alone a small dog against a pit bull. But society chooses to allow pit bull ownership because slimy nutters have enacted statutes that protect their rights to own mauling machines.